Sara is a professional handler, AKC registered and a member of the Professional Handlers Association, with a reputation for having a special talent for exhibiting dogs. To date, Sara has championed over 100 dogs. She is a multi-Best in Show handler and is credited with having multiple group winners and group placements. A competitive and confident professional, Sara is precise in her presentation of dogs, as well as adamant about the well-being and attitude of dogs in her care. Sara began her handling career in 1994 as an owner/handler of her own bullmastiffs. She purchased her first purebred female bullmastiff with the intent of having “Diamond” simply be a companion to her mixed breed “Bo.” But with encouragement from other bullmastiff breeders and a few handling classes, Sara took Diamond to her first All-Breed AKC Sanctioned Breed Match, and took a Group 4. Sara felt she had found her niche. While showing her dog at point shows, Sara was approached by a fellow bullmastiff owner and was asked to begin showing another bullmastiff. She accepted the job, and this led to a realization that she wanted to make a career out of showing – not just for the compensation, but because it was now a true passion. 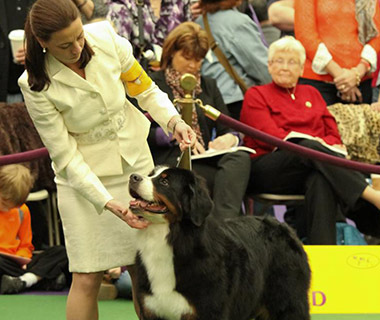 Sara proceeded to expand her knowledge of exhibiting, show etiquette, professionalism, and conditioning top show dogs. Sara’s clientele grew rapidly. Her love for the sport, for dogs, and the appreciation she felt toward the professional handlers that helped her, led her to share her knowledge and skills by teaching handling classes. She now instructs owners and future professional handlers on how to exhibit their dogs. Sara dislikes the rumors of the “stereotypic” show dog life style, and ensures her clients that all her dogs are treated with the sensitivity and care any canine needs. As hectic and chaotic as the world of dog showing can get, Sara always takes the time to make sure that all the dogs in her possession are exercised both mentally and physically. As her clients have always said, Sara goes “above and beyond the call of duty,” making the owner comfortable with putting the dog in her care. The owner also knows she will “get the job done” as well. Sara also feels that bonding with the dog is an essential tool in the proper presentation of dogs. A happy and well-adjusted dog results in a show-winning attitude! Sara is available for private training and consultation work and for professional assessment of dogs for potential showing.